This is Jimmy Cliff live in concert during a tour supporting the release of his 1982 album 'Special'. This recording is from a concert in Kansas City, MO, USA on the 9th October 1982 and features six of the eleven songs on the 'Special' album. This is Tim Buckley performing just four songs at the Denver Pop Festival held at the Mile High Stadium, Denver, USA on the June 28th 1969. 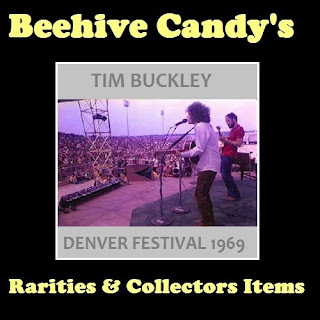 Tim Buckley's short life is well documented, so a little about the actual Denver festival. The Denver Pop Festival was a three-day music festival promoted by rock promoter Barry Fey (Feyline) on June 27-June 29, 1969 which was largely overshadowed by Woodstock two months later. Unlike the free-form happening in upstate New York, the Denver festival had the full support and local resources of a major city, taking place in Denver Mile High Stadium. There were high expectations for the Festival; it was commonly called the "First Annual" Denver Pop Festival. The peak attendance was estimated at 50,000.